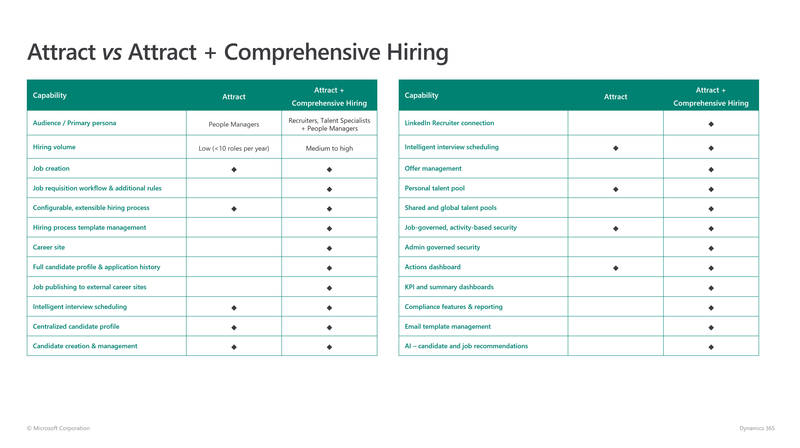 In October in connection with the October release, Microsoft released several functions in Attract that required a new type of license, the Comprehensive Hiring Add-on/SKU. There has been a lot of questions about this on the Microsoft Community, this post is a direct consequence of the lack of information on the license. That is basically all the new cool functionalities for recruiting. The picture below is a good overview to see what you get with and without the add-on. How is the license calculated? Have a sufficient number of Talent comprehensive hiring (100 employee pack) add-ons to meet or exceed the number of employees on payroll. If you are a company of under 1000 employees you have to buy the Tier 1 SKU to match your number of employees on payroll. You have to buy one pack per 100 employees, so if you have 350 employees you have to buy 4 packs of the Tier 1 SKU. If you wish to buy this licenses you have to contact your license partner or contact me directly as Point Taken AS (The company I work in) is a license partner. Finally some good information about the hiring add-on SKU! Thank you very much. One additional question, is the comprehensive hiring pack (tier 1-3) a single time payment or also monthly? The sku is a monthly payment. We have the license for Comprehensive hiring via CSP but struggling to manage the license administration (how do you assign to users? ), it seems different from the rest of Talent. Even with this, can we post jobs to linkedin and other job sites? The Add-on is not a per user license, it’s one license per company. As long as you buy the correct amount of packs you should be able to post jobs to LinkedIn and other job sites. If you have bought the license and still aren’t getting access, you have to submit a ticket to Microsoft.